Enjoy seeing the Canadian Horseshoe Falls in all its glory with this guided 9-hour tour from Toronto. Will take you to the central part of Niagara for exploration and excitement on this hands-on, up-close and personal tour of Niagara Falls Canada. Bring home the memory of a lifetime after witnessing over a million gallons of water per minute rush over the Falls. 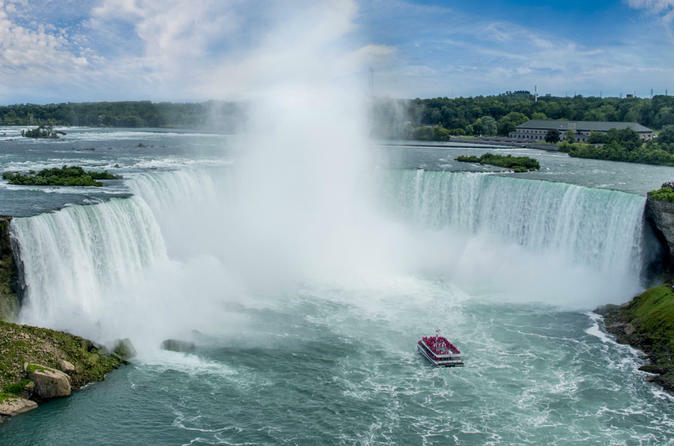 After taking in the natural beauty of The Falls, the guide will take you through a scenic drive towards the historic town of Niagara-On-The-Lake with scenic stops such as Floral Clock, Whirlpool Rapids, and The World's Smallest Chapel along the way. After free time at Niagara-On-The-Lake, enjoy an award-winning winery for a complimentary wine-tasting. This fully-guided tour will consist Canada’s most sought-after attractions in the heart of Niagara Falls. You will be picked up from Downtown Toronto in a coach bus or mini coach bus. This fully narrated tour will take you through a 1.5-hour drive from Downtown Toronto to Niagara Falls. The guide's commentary will include geological and historical facts, stories, and fun anecdotes. You will first stop at the Table Rock Complex where you will get your first view of the Falls. You will have free time to walk around and explore, feel and hear the falls up close. Choose to go on the Hornblower Cruise (seasonal and 'must do' experience from April - December). This famous cruise is a popular attraction, a whole new way to see Niagara Falls, The legendary Niagara Falls boat tour has thrilled royal dignitaries, Presidents, Prime Ministers and Hollywood A-list celebrities from around the world. Now it's your turn to experience this world wonder: Or choose the Journey Behind the Falls is all year-round attraction that offers a unique view of the Falls from below and behind. The observation deck lets you bask in the waters a few feet away from the waterfall. Explore the tunnel system that goes beneath the falls for a never-before experience of the famous Niagara Falls. Journey Behind the Falls is an iconic Niagara's experience. In the winter, Skylon tower will be replacing the Hornblower cruise. Get to see the winter wonderland that the Niagara Falls turn into from the 360 degree-view observation deck from the highest tower in the Niagara Region. Enjoy a Lunch at the Sheraton Fallsview Restaurant for a high-rise view of the falls. This buffet lunch option includes full, floor-to-ceiling windows and provides a wide array of food choices and a spectacular view of the Falls. The guide will then take you on a scenic drive towards Niagara-on-the-Lake. Stops along the way include the Floral Clock – consists of 2000 flowers when fully-bloomed. Stop by the Whirlpool Rapids and look down at white water of the Class-6 Whirlpool Rapids. Then, take a photo-op at the world’s smallest chapel. When you arrive at the historic town of Niagara-on-the-Lake, you will have free time to explore on your own and take the opportunity to shop at the boutiques and stores. The tour will conclude with a stop at an award-winning winery where you will enjoy a commentated wine-tasting from an expert winemaker. The tour guide will then drive you back to Toronto to end a magnificent day at Niagara Falls!